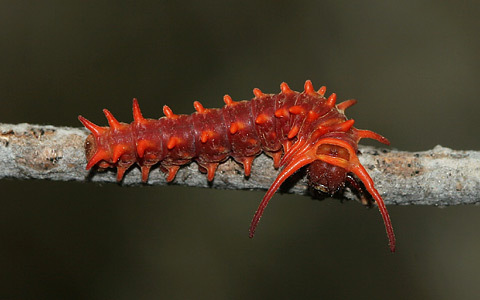 Battus philenor is sometimes called the pipevine caterpillar or swallowtail caterpillar. The adult looks pretty cool, but take a look at the caterpillar. As caterpillars they feed on the toxic plants Aristolochia and the poison accumulates in their body providing them with a chemical defence. Battus philenor is known from North and Central America.